More on the attempted theft of a $10,000 mountain bike that left the manager of the Incycle Chino store critically injured. Incycle store manager Megan Rodriguez suffered a broken hip, ribs and foot, as well as a fractured skull, when she was run over by the thieves’ truck as they tried to get away with the bike. Store mechanic Raul Ureno was able to retrieve the bicycle from the back of the truck after chasing them down in his car, but wasn’t able to prevent them from getting away. According to KTLA-5, police are looking for the following suspects. Police described one of the suspects as a white male, possibly in his 20’s, standing at around 5 Feet 9 Inches tall, weighing 190 Pounds. He had a full beard and was last seen wearing a black baseball cap, sunglasses, black Hollister hooded sweatshirt, ripped denim jeans and black shoes. The second man was described as a white or Hispanic male in his 20’s, standing at around 5 Feet 11 Inches tall, weighing 165 Pounds. He was last seen wearing a white and blue baseball cap, sunglasses, a black jacket with a gray hood, a red and blue flannel shirt, black pants and black shoes with white lining. The driver was described as a white female with a thin build and short stature. She has light-colored hair and was last seen wearing round frame sunglasses, a thick black hooded sweatshirt and red lipstick. The truck they ran down Rodriguez with is described this way. The three fled in a blue-gray GMC Sierra truck with a black paper plate on the rear and chrome detailing on the sides, handles and mirrors. The rear driver door is missing the chrome trim. It is possibly a 2008 model. Security video shows the suspects casing the San Dimas Incycle store before moving on to hit the Chino Incycle location. As of this writing, a crowdfunding page for Megan Rodriguez has raised over $16,000 of the $25,000 goal in less than 24 hours. However, it also shows Rodriguez slipping under the truck’s rear wheel as she tried to stop the thieves; you may not want to see that. There’s a $10,000 reward for information leading to their arrest. Photo of Megan Rodriguez from GoFundMe page. Thanks to Steve S for the heads-up. Curbed looks at the proposal for a Green New Deal for Los Angeles to fight climate change. We’ll know city leaders serious when they finally commit to efficient, clean transit and safe bike lanes and sidewalks, and take concrete steps to reduce the number of cars on the street. Including in Paul Koretz’ and Gil Cedillo’s auto-centric districts. Until then, it’s all just more talk. And more BS. Just like all the other far-reaching the city has adopted, and forgotten. No, it’s not a safety measure to make pedestrians wave a brightly colored flag to cross the street. The flags should be white. Because it’s a failure of street design and a surrender to the dominance of motor vehicles. Yes, the dispute was over a motorcycle, not a bicycle. But the point remains: Don’t set your mother on fire if she refuses to buy you a new one. South LA residents held a vigil for fallen bicyclist James Findley, who was killed by a speeding, street-racing driver on Monday. KCBS-2/KCAL-9 says e-scooter injuries — and the resulting lawsuits — continue to climb. The Eastsider looks at plans to build a 1,000-foot bikeway to connect the Arroyo Seco Bicycle and Pedestrian Trail with the Arroyo Seco Bicycle Path along the LA River. Lawndale residents are concerned that bike thieves are targeting their neighborhood. Someone should tell them that bike thieves are targeting every neighborhood. The Santa Monica Police Department will conduct their next bicycle and pedestrian safety enforcement operations this Friday and Monday, targeting any violations that put people on bikes or on foot at risk, regardless of who commits them. So once again, ride to the letter of the law until you cross the city limits so you’re not the one who gets ticketed. A San Diego man warns against the dangers of e-scooters after he barely survived a crash when he rode out in front of a driver. The easy way to avoid that is just obey the right-of-way and don’t ride out in front of anyone. A new Ventura workshop gives homeless people a place where they can fix their bikes and buy low cost parts, while allowing them to work for store credit. Caught on video: A trip down a San Jose bikeway shows all three major kinds of bike lanes in just three minutes. A San Francisco TV station says homeless people have set up a used bike shop behind a children’s playground. Or more likely, a bike chop shop, just like the dozens in the LA area. The Bike League outlines a Green New Deal for bicycles. Bicycling offers tips on how to buy a used bicycle. Although they left out the most important one — make sure it’s not stolen. A VeloNews podcast examines why the remaining Performance Bicycle stores are going belly up. A proposal intended to fight bike theft by homeless people in Alaska would make it a crime to possess a bicycle with the serial number removed, with a fine up to $10,000; that would allow police to seize the bike to search for the real owner. Then again, if homeless people could pay a $10,000 fine, they probably wouldn’t be homeless. Utah’s on-again, off-again bill to legalize the Idaho Stop Law is back on again, after passing a vote in the state House. The first Colorado city has taken advantage of the state’s new modified Idaho Stop law allowing bicyclists to treat stop signs as yields; the law allows each town to decide for themselves whether to let it go into effect. The problem with that is that what’s legal for bike riders in one town may not be legal across the street, with no way to tells you’ve gone into another jurisdiction, or what the law is there. The traffic safety denier attack on road diets continues to spread across the US, as demonstrated by an op-ed from the Waverly, Iowa branch of Keep the US Moving — the offspring of LA-based motorist pressure group Keep LA Moving — claiming that road diets prevent emergency vehicles from getting through. Chicago will host the city’s first-ever summit of black bike riders next week. A carfree Detroit resident describes how he survived the polar vortex. A Buffalo NY newspaper marks the passing of one of the few blind bike mechanics in the US. Good for them. A DC proposal would prohibit drivers from stopping, standing or parking in a bike lane, while limiting the situations where they can even drive into one. The latest Shift Up Podcast discusses an Atlanta tour company’s use of bikes as a gateway tool to celebrate history and explore the city. A New Orleans TV station says bike riders are afraid of getting hit by cars in shared bike lanes. Someone should tell them that sharrows aren’t bike lanes. And I’d be scared too. Miami Dolphins cornerback Dee Delaney kept his word, buying a custodian at The Citadel the new bicycle he promised him as a freshman. Cambridge, England residents are outraged that police apparently have better things to do than ticket people for riding bikes on the sidewalk. A British man forgives the truck driver who put him in a coma for a month by crashing into his bike when the driver changed lanes without warning, and tells him to get on with his life. The court was almost as kind, settling for a weak slap on the wrist by fining him the equivalent of just $641 and letting him keep his license. Darn those pesky bike riders, getting in the way of the Netherlands becoming the world leader in driverless cars. An Aussie writer examines how a Green Wave can make bicycling easier, by setting traffic lights to give bike riders continuous green lights. Cycling scion Taylor Phinney says he’s all in for April’s Paris-Roubaix classic after last year’s eighth place finish. The Movistar pro cycling team is the latest to offer a virtual cycling competition, allowing you to compete against the pros from the comfort of your own home. Pro cyclist Fabio Aru gave the pope his Colnago racing bike to be auctioned off, with the proceeds going to an aid project. Science says sports drinks work, even if they are overhyped. Evidently, you’re not allowed to carry cats on your bike. And your next car-mounted bike rack could be held on by suction cups. If you find yourself alone this year, take a few minutes to do something nice for yourself today. Just don’t ride your bike until this rain lets up if you don’t have to. And if you do, light yourself up so drivers can see you despite the limited visibility. Maybe that painted bike lane is safer than you think. In a new study from a Canadian university, researchers rode bicycles equipped with sensors and a handlebar-mounted camera to measure how close drivers pass people on bicycles. The results show that on two lane roads without bike lanes, motorists passed people on bicycles too closely 12% of the time, based on the equivalent of a three-foot passing distance. But on roads with bike lanes, that dropped to just 0.2%. On four lane streets, incidents of close passing dropped from 6% to just 0.5%. The university plans to use that data to develop tools to determine where bike lanes would do the most good. Bike thieves walked out of the Chino Incycle Bicycles with a $10,000 mountain bike, then ran over the manager when she tried to stop them. Bike mechanic Raul Ureno chased the thieves in his car and managed to get the bike back, though he was unable to stop them. The manager, who wasn’t named, suffered a broken pelvis, crushed ribs and fractured skull. There’s a $10,000 reward for the suspects. Let’s hope someone takes them up on it. A Rancho Mirage-area Strava user posted a photo of a powerful billboard featuring fallen cyclist Will Campbell. Too bad we don’t have the money to put these up everywhere, one for every rider who loses their lives on the streets. Maybe then drivers would start to pay attention. Thanks to Steve S for the heads-up. In yet another example of LA leaders’ rhetoric exceeding their actions, bike-friendly Councilmembers Mike Bonin and Nury Martinez were joined by the decidedly unfriendly Paul Koretz in calling for a Green New Deal for the City of Los Angeles. Never mind that Koretz has consistently blocked much-needed bike lanes in his Westside district, forcing residents to rely on carbon fuel-driven motor vehicles. And gone out of his way to fight the density that would cut trips for work, school and shopping. Koretz has long positioned himself as LA’s most ecologically minded councilmember. But until his actions catch up with his words, they’ll remain just that. Thanks to Megan Lynch for the link. Mountain biker Brandon Semenuk tells the full story behind the most viewed mountain bike video of all time. If you’ve got four minutes to spare, it’s worth taking a brief break in your day to watch the original video. Which is a lot shorter than the 24-minute explanation. Good news, Los Angeles. You no longer have the worst traffic in the US. In fact, we’re not even in the top five. CiclaValley offers a video essay on the best route from the San Fernando Valley to the Westside, suggesting Fryman Canyon to Franklin Canyon, with a surprisingly low 442 feet of climbing. I’m going to save that one for my next trip over the Hollywood Hills. A San Diego site says it’s time to reign in e-scooters, as the city’s mayor proposes to do just that. More sad news, this time from Bakersfield, where a man was killed when he allegedly rode his bike out in front of an oncoming car at an intersection. Redding prepares to open a new bike path connecting downtown to the Sacramento River, replacing what residents call a harrowing one-mile journey. Bicycling offers nine tips on how to get a stolen bike back, including recommending Bike Index as your best bet to register your bike after the theft. You can report your stolen bike with Bike Index right here on this site. Then again, why wait until it’s too late? You can kiss the last remaining Performance Bicycle locations goodbye; if you don’t make it in before March 2nd, it will be too late. Thanks to Mike Wilkinson for the tip. If you can get past the Wall Street Journal’s paywall, you can read about a Hawaii man who took a five-day ride around the coast of the Big Island once the Kilauea volcano settled down. The rich get richer. Portland is attempting to reclaim its title as America’s leading bike city by building 16.5 miles of protected bike lanes. And getting rid of 1,000 parking spaces in the process. Crosscut profiles the active transportation director for the Washington State Department of Transportation, asking if she can save bicycling in the state. Caught on video: Police in Mesa AZ are looking for three people who attempted to run over a group of bike cops, crushing their bikes as they jumped out of the way. Utah’s legislature is moving forward with a bill that would allow bike riders to go through red lights if they don’t change after stopping for 90 seconds, over the objections of law enforcement. Um, sure. An allegedly drunken San Antonio driver who killed a bike riding surgeon says she fled the scene because she got frightened after thinking she ran over something. Meanwhile, his accused killer is out on $50,000 bond. Sure. Doesn’t everyone get terrified when they drive over a stick or a speed bump or something? Thanks to Stephen Katz for the tip. Lime is pulling the plug on it’s bikeshare service in Hartford CT, leaving the city scrambling for a replacement. While Los Angeles bike riders wait for the DA’s office to finally file charges against the hit-and-run driver who killed Frederick “Woon” Frazier, the NYPD has failed to make arrests in four recent hit-and-runs involving people on bicycles, including two where they know the identity of the driver. Which begs the question, why should drivers take hit-and-run seriously when police and prosecutors apparently don’t? About damn time. A well-funded global alliance launched in the nation’s capital with the goal of finally putting people before cars on our streets. After that Greenville SC boy jumped on his bike to get help for his unconscious father, bighearted local firefighters surprised him with a new bicycle. Vancouver police help a group of college engineering students recover their custom-designed, hand-built, one-of-a-kind racing ebike after it was stolen. London is responding to the death of a bike rider by banning cars entirely from three roads leading into a busy junction in the city’s financial district. Caught on video too: A London bike rider discovers an air horn can move mountains. Or at least pedestrians blocking bike lanes. Be sure to stay to the end for the totally unsurprising response; thanks again to Steve S.
Liverpool manager Jurgen Klopp is one of us, riding a bicycle into the English Premier League team’s Spain training camp, as they take a break from the title chase. Amsterdam has a nine-year old junior bike mayor. Which is exactly one more than Los Angeles has, junior or otherwise. Bari, Italy is now the first Italian city to pay residents to bike to work, up to the equivalent of $28 a month. They get it. Melbourne’s leading motoring organization is recommending that bicycle superhighways move to the top of the state government’s infrastructure plans to fight traffic congestion in the city. An Aussie writer calls for a little sympathy and tolerance after reading the disturbing comments following the death of a bike rider. A Singapore man has been spotted again riding a bicycle while towing a strange ladder-like metal extension. Unless it actually is a ladder, in which case it’s not strange at all. Lawson Craddock, the pro cyclist who finished dead last in his first Tour de France after riding the entire race with a broken collarbone, is working his way back to this year’s race with a new attitude as a new father. Fifty-eight-year old former Tour de France stage winner Sean Yates has turned to an ebike to keep riding after suffering a heat defect that limits his pulse rate to just 90 beats a minute. Rouleur talks with 1960s six-day race superstar Patrick Sercu. Apparently it’s against the law to ride a moped while carrying a bicycle in some places. Climbing the legendary Mont Ventoux without a seat. And it may be about to get wet out there, but at least this is one problem we don’t have in LA. A self-described “avid cyclist” — and, ahem, president and CEO of the Colorado Automobile Dealers Association — just doesn’t get why the automobile has become a public enemy, arguing that a fundamentally American freedom is under attack. You know, the freedom for drivers to spew smog into the air with your gas guzzling SUV, which is right up there with freedom of speech or religion. Except virtually every argument he makes for why the state shouldn’t adopt California’s clean air standard works against him. Maybe he’s never tried to breath Denver’s air during one of the city’s frequent winter temperature inversions. Let alone heard of climate change. Then there’s this tired old myth. Meanwhile, some cities have put their drivers on forced road diets. They are reducing lanes available to drivers on key arterial streets. Part of the motivation is to increase bicycle and bus lanes. But again, this gift comes at a cost to drivers. The goal is to discourage driving by intentionally reducing capacity and creating traffic congestion by design. Backers say it’s more “people friendly” — at least for people who don’t need to drive. The bottom line is they want to force more residents to use alternative transportation by making driving as unpleasant as possible. Because those road diets couldn’t possibly be about slowing traffic and keeping those people in cars alive long enough to get back home. Or reducing congestion so that people who need to drive, or simply choose to, can actually get where they’re going in a timely manner. But maybe that’s what happens when you only see the world through the perspective of your own windshield while driving your bike hundreds of miles to that distant trailhead. Not to mention when your own bank account depends on convincing other people to buy those bigass trucks and SUVs. But hey, no bias there. Then again, he’s not the only one. A writer for a motorists’ website devoted to maintaining automobiles über alles says recreational roadies are okay, but those urban bike advocates are just Vision Zero zealots dedicated to forcing poor, innocent drivers like himself off the roads. Thanks to Erik Griswold for the heads-up. And credit Peter Flax with uncovering gem from a guy who’s not going to let the sick tyranny of a small minority of anti-car extremists push him onto disease-filled public transit. Fresno police are urging you to be on the lookout for 32-year old alleged bike thief Marlon Markham, who is wanted for buying bicycles with fraudulent credit cards under a variety of names throughout California. He then reportedly sells the bikes online. In addition to the Central Valley, he’s struck in the Bay Area, and in Burbank and Huntington Beach in SoCal. Metro Bike begins what so far is a very limited expansion into Koreatown. Friends and family members gathered at the ghost bike for fallen Aliso Viejo bike rider Michael David Tomlinson for a candlelight vigil and to remember him, nearly a week after he was killed by a hit-and-run driver. Over 40 military veterans took part in the annual Soldier Ride in Del Mar over the weekend, sponsored by the Wounded Warrior Project. Berkeley plans a Complete Streets makeover of a popular bicycling route to support and grow the city’s 8.5% bike rate. Thanks to Megan Lynch for the link. Streetsblog notes that Oakland has finally gotten it right on protecting bike riders in a construction zone. On one block, anyway. A Richmond paper examines how the city’s Rich City Rides co-op helps transform lives one bike at a time — exemplified by a 15-year old homeless boy who searches the city for kids without bikes to help them earn one. Once again, an independent student newspaper at UC Davis mistakenly thinks that violence against bike riders is funny, publishing what they believe passes for satire about someone kicking bikeshare riders off their ebikes. A Davis judge rules that a bike seat can be a deadly weapon, after a father and son were attacked by a man who threw his bike at them after removing the seat, then used the seat as weapon. Singletracks offers tips on how to reduce your risk of injuries from mountain bike crashes. The most effective way is just don’t ride mountain bikes, but that kind of defeats the purpose. City Lab says the micromobility gold rush is just beginning. In a move that really shouldn’t surprise anyone, Utah’s legislature hit the brakes on a proposal to legalize the Idaho Stop in the state. In yet another example of keeping a dangerous driver on the road until it’s too late, an allegedly drunk San Antonio hit-and-run driver had a prior arrest for driving while intoxicated, but with no record of a trial or guilty plea; her victim was a local surgeon. Thanks to Stephen Katz for the tip. A 72-year old Wisconsin driver faces a vehicular homicide charge for the death of a bike-riding pediatrician, claiming he couldn’t brake in time to prevent the crash — even though he rear-ended the victim while driving half off the road. Someone should tell Bowling Green, Ohio that sharrows aren’t Complete Streets. Two years later, Pittsburgh bike riders and pedestrians still feel safer sharing the road with self-driving vehicles than with human drivers, whether or not they’ve actually encountered one. Bikeshare continues its spread across the US, as Portland — no, the one in Maine — moves towards establishing their own system. DC moves to protect pedestrians and bicyclists by banning right turns on red lights at 100 intersections. A University of Florida study shows that Strava really can be used to help city planners design better bikeways. Cycling Weekly offers advice on how to avoid back and shoulder pain caused by riding a bike. Seriously? A Canadian judge acquits a truck driver, saying sure, he had to have seen the bike rider he killed before he right hooked her, but that doesn’t mean he actually, you know, noticed her. Oh, and that failure to signal or wait for the green turn arrow? No biggie. Calgary’s winter bicyclists get new bike racks that are part bike parking, part public art. I’ll settle for anything that actually keeps my bike safe. Like maybe a fully operational tank. A Hamilton, Ontario columnist misses the point, saying you can’t redesign roads to get rid of reflexive carelessness or stupidity. Even though that’s exactly the idea behind Vision Zero, to engineer roads so careless mistakes don’t lead to needless tragedies. Life is cheap in Canada, where a careless driver who killed one bike rider and injured two others walks with a lousy $1,800 fine. A British 14-time Paralympic gold medallist gets it, saying build bike lanes that are fit for everyone, and not just the brave. The family of a fallen UK bike rider complain about the six-year sentence given to the driver who killed her while “extremely drunk” and high on coke. An Irish driver will face charges for plowing into a club ride in 2017, killing one rider and critically injuring another. Kiwi bicyclists complained about over 100 close passes by bus drivers last year. Although it’s not so easy to complain about getting knocked over when you can’t find out what bus company did it. The Philippine legislature is considering the equivalent of a nearly five-foot passing law, with penalties starting at $95 for the first offense, and increasing with each additional violation. Speaking of the Philippines, is anyone really in the mood to bike the full route of the infamous Bataan Death March? Didn’t think so. VeloNews offers their thoughts on the upcoming Amgen Tour of California, saying the men’s side will come down to Peter Sagan versus Fernando Gaviria, while the women will face their first hors categorie climb with the Mt. Baldy finish. Former world champion mountain biker Hans Rey has helped provide more than 11,000 free bicycles to people in 30 countries through his Wheels4Life charity. Try taking your bike off the roof rack before going through a drive-thru next time. Sure, he may be an armed robber — and a Chargers fan — but anyone who makes his getaway by bike can’t be all bad. And the SaMo PD posse was in full pursuit of a stolen car. One quick note before we get started. 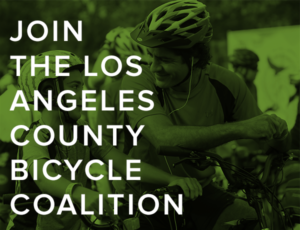 Last Friday, I had a very pleasant talk with Communications Director Dana Variano and new Executive Director Eli Akira Kaufman of the Los Angeles County Bicycle Coalition, aka LACBC. I won’t go into details, since everything we discussed was off the record. But we had a very frank and open discussion about the state of bicycling in general, and the state of the LACBC in general. Suffice it to say that Kaufman recognizes that he’s got a steep learning curve to get a firm grasp on LA bike culture and street safety. And he’s well aware of the problems facing the LACBC after drifting far too long without effective leadership. But he’s committed to listening and improving communications, which has been a major problem as long as I’ve been involved with the coalition, as a member and former board member. And to making the hard decisions the LACBC will need to return to being an effective voice for LA bicyclists. I left the meeting feeling like the LACBC is in good hands. And with a little hope for the first time in a long time. Disappointing news from Seal Beach, where Eric Dalton reports the ghost bike for Paul Smith has already been removed, less than three weeks after he was killed. The popular church leader was riding on PCH at Seal Beach Blvd when he was run down from behind by an allegedly speeding driver. At this point, there’s no word on who removed the ghost bike, or why. But it’s heartbreaking that someone apparently didn’t think he was worth remembering for even a month. Let alone reminding drivers of the dangers of SoCal’s killer highway. A new UCLA study shows e-scooters pose pretty much the same risks you might think. Of the nearly 250 people treated by UCLA medical centers in Westwood and Santa Monica as a result of scooter injuries, the overwhelming majority of injuries were suffered by the people riding them — not pedestrians struck by them, as we are so often led to believe. “In this study of a case series, 249 patients presented to the emergency department with injuries associated with electric scooter use during a 1-year period, with 10.8% of patients younger than 18 years,” says the January 25 paper by Tarak K. Trivedi, Charles Liu, and Anna Liza M. Antonio. Of course, there’s no word on the severity of the head injuries, which could have been anything from simple cuts to concussions, skull fractures or cranial bleeding. And no way to know whether helmets could have prevented them. Then there’s this from Forbes. Not all of the injured patients had been riding scooters. Eleven had been hit by scooters, and five had tried to lift scooters. Another five had simply tripped over parked scooters, which is what can happen when there are Bird or Lime droppings on the sidewalk. In other words, despite the panicked response to this study in the media, over 90% of the injuries were to the people riding them. So just like with bicyclists, even the most careless riders are a danger primarily to themselves. Just wait until the study authors discover how many people get hurt by cars every day. Which is not to say everyone shouldn’t ride safely, so they don’t pose a risk to themselves or anyone else. And for chrissakes, don’t leave your damn scooter on the sidewalk, or anywhere else it can pose a danger to anyone. Thanks to David Drexler for the heads up. NHL All-Stars Marc-Andre Fleury and Kris Letang apparently didn’t get the memo that scooters are dangerous, arriving at the game on a pair of Lime e-scooters. Howard Valai forwards video of what it looks like when an LA Metro bus passes about a foot off your handlebar. If anyone had opened the door on any of those cars, he could have seriously injured. Or worse. Life is cheap when you ride a bicycle. A Colorado truck driver gets an all-too-brief 90 days behind bars, and 120 days work release, for running down a 17-year old boy from behind as he rode in a bike lane, then fleeing the scene and leaving his victim seriously injured in the street. A speeding hit-and-run Maryland driver got just 18 months behind bars for running a red light and killing a Smithsonian IT specialist who was riding his bike to work last September. A teenage driver walked with community service for killing a bike rider in the UK by trying to pass on a narrow country road at 60 mph — which the driver’s lawyer wrote off as a simple misjudgment. One that cost an innocent man his life. But sometimes justice gets done. Like the Florida driver who got over 13 years behind bars for the drunken, high-speed crash that killed a man on a bicycle. Or the Japanese man who got a well-deserved 18 years for the road rage death of a motorbike rider, intentionally slamming into him after briefly chasing his bike. Thanks to Norm Bradwell for the link. I don’t even know what to make of this one. In a video posted to an anti-bike group, an Aussie driver drove down a bike path to swear at a couple of cyclists for riding in the roadway instead of on the parallel path. Needless to say, opinions on the auto-centric site ran in favor of the foulmouthed driver, with one poster calling for him to be named Australian of the year. If you haven’t already, mark your calendar for International Winter Bike to Work Day on February 8th. We should be able to show a good turnout here in Southern California, where Viking Biking means you might have to put fenders on your bike. UCLA will host a panel discussion on Transportation as a Public Health Issue this Wednesday, with Dr. Muntu Davis of the LA County Department of Public Health, Juan Matute of UCLA Institute of Transportation Studies, and LADOT General Manager Seleta Reynolds. 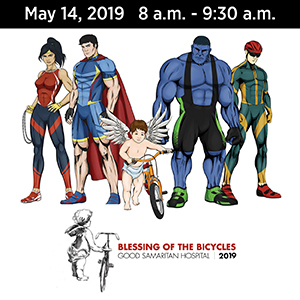 The LACBC will hold a historic tour of San Fernando and Pacoima Sunday morning as part of their monthly Sunday Funday rides, which promises to get you home in time for the Super Bowl. Cycling scion and three-time national time trial champ Taylor Phinney takes his new team on a tour of the City of Angels and prove he knows it well, including stops at Bicycle Coffee and Golden Saddle Cyclery. The editor of USC’s Daily Trojan takes a very auto-centric view of Metro’s proposed congestion pricing, saying transportation will always be a citywide struggle. Meanwhile, that Metro proposal also includes possible ride-hailing fees on Uber and Lyft, and shared-mobility fees on dockless bikeshare and e-scooters. South Pasadena has accepted $332,000 from Metro to pay for the upcoming 626 Golden Streets open streets event through South Pas, Alhambra and San Gabriel this May. A Santa Clarita letter writer says please leave your bikeshare bikes in the racks where you’re supposed to, rather than abandon them anywhere. Long Beach police are looking for a serial groper on a distinctive lime green bicycle who’s attacked four women in separate assaults. Former pro cyclist and current Long Beach Bike Ambassador Tony Cruz had his bicycle stolen last week; be on the lookout for an $8,000 Felt FR1 carbon bike with Sram e-Tap shifters and $1,300 Mavic Carbon Cosmics wheels. State workers can now get reimbursed for their dockless ebike and scooter rides. Some things never change. Nice to see the OC Register is still giving voice to ridiculously conservative anti-transit op-eds, despite layoffs and ownership changes, and a Congressional map that’s turned solid blue. The paper also says drivers probably don’t know what a sharrow is, which is probably true. Bike advocate Roberta Walker has begun a rehab program after suffering extensive brain and spinal injuries when she was run down by a driver on PCH in Leucadia last month, while Encinitas has begun rehabbing the roadway to keep it from happening to someone else. A crowdfunding page has raised over $97,000 of the $125,000 goal to help pay her hospital and rehabilitation expenses. Camarillo police are looking for a man in his 20s who assaulted a woman who was walking on a bike path; fortunately, she was able to fight them off. An Oakland woman has been charged in the hit-and-run crash that critically injured a 14-year old boy, who was dragged three blocks under her car after she hit his bike; she was already on probation for a DUI conviction last fall. As we mentioned last week, Marin transportation officials want to cut the four-year pilot program for a bike and pedestrian lane on the Richmond-San Rafael Bridge to just six months, so they can declare it a failure and turn it back over to people in cars. There’s a special place in hell for whoever stole 24 bikes from a bicycling club at a Modesto elementary school. And just the opposite for a kindhearted people who replaced 20 of them. The CHP does more than catch speeders on the freeway. A Redding mountain biker was airlifted to a hospital after apparently breaking his leg in a fall. Great. The plague of LA-based traffic safety deniers has gone national, forming the new agitprop group Keep the US Moving to spread their virtually fact-free campaign to keep our streets deadly and halt all road diets, anywhere. Thanks to Peter Flax for the tip. Okay, now I’m impressed. Idris Elba is one of us, going for a casual bike ride with his fiancé in Hawaii. The route has been announced for this year’s 450-mile Ride the Rockies, featuring 28,000 feet of elevation gain through the Colorado high country. A Minnesota singer found the inspiration for her debut album in the hum of her bike chain. She gets it. A columnist for the New York Post says drivers are getting away with murder. New York is still trying to figure out how to deal with ebikes and scooters. Big Apple Mayor Bill de Blasio says the city doesn’t have the resources to go after drivers who block bike lanes. Which is odd, since most of them seem to be NYPD cops. Mississippi bicyclists ride 6.6 miles in honor of fallen cyclists. Drivers and doors aren’t the only things we have to worry about. A Vancouver bicyclist was killed when he somehow collided with the friend he was riding with, and fell into the path of a truck. Canada has cancelled plans for a $65.9 million bike path paralleling a scenic highway through the Rocky Mountains due to environmental concerns and high costs. But all those cars spewing smog are just fine, thank you. Calgary’s new e-assist bikeshare is a huge hit, even in the winter cold and snow. The UK could save the equivalent of over $420 million if bicycling could be made as popular in the rest of the country as it is in London. Well deserved. A British triathlete was fined the equivalent of more than $1200 for aggressively passing a horse and rider on the curb side, colliding with them as causing the horse to bolt, injuring the rider. The German ambassador to Pakistan went out of his way to find a locally made bike, because he wanted that Made in Pakistan stamp to show his support for the country’s people. A bighearted South African boy broke open his own piggy bank to buy a new bicycle for a gas station attendant he befriended. Sad news from New Zealand, where a 32-year old elite cyclist is dying of intestinal cancer, saying she should have pushed harder for a diagnosis after suffering from years of stomach pain. A Singaporean news channel examines why the island city has yet to become a bicycling paradise, pointing a finger at the heat and rain, and a lack of safe space on the road. Long Beach will host this year’s Paratriathlon National Championships in June. Cycling Tips looks at how a little known cyclist from Cuba beat the world’s best women’s riders in the Cadel Road Race. Road.cc offers advice on how to step up from riding sportives to your first actual bike race. The LA Times says Zwift’s new esports league is just like pro cycling, but without the turns or crashes, and with actual pro cycling teams. You may not have to worry about drivers on a bike path, but keep your eyes peeled for pigs. How to build a bicycle sidecar out of an empty beer keg; make it a full keg, and you’ve got a deal. And nothing sells Danish beer like a good bike ride. Call it a sneak attack. Over the weekend, supporters of traffic safety deniers Keep LA Moving tried — and failed — to get the LA Neighborhood Council Coalition on the record supporting a total ban on road diets. The factually incorrect motion, which traffic safety supporters found out about less than 24 hours earlier, was tabled until next month after it met overwhelming opposition. Here’s the full text of the motion, in case you want to mark your calendar for the next meeting. 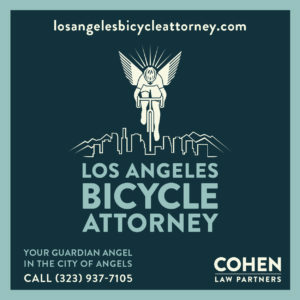 BikinginLA sponsor Josh Cohen wrote a powerful message opposing the ban. Today’s photo comes with a wish for a Happy Chanukah to all those celebrating this week. 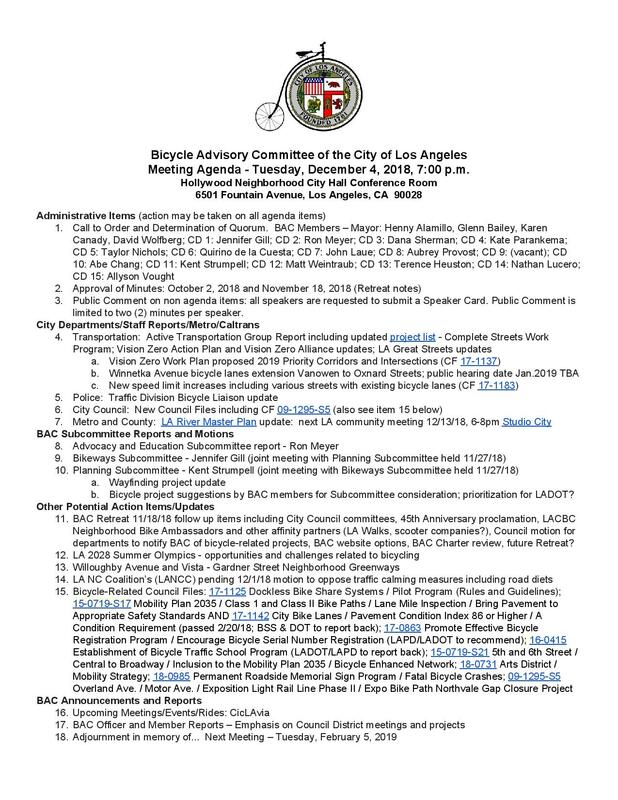 The Los Angeles Bicycle Advisory Committee will hold their regular bi-monthly meeting tomorrow night in the conference room of the Hollywood Neighborhood City Hall, 6501 Fountain Ave. The committee is the only official voice for bicyclists in city government. Even if elected officials usually just ignore it and hope it goes away. Today’s common theme is ebikes. Or more precisely, the way ebikes and other bikes can benefit people with physical limitations. Curbed’s Alissa Walker calls ebikes a game changer for people who need them. And makes a point I’ve been making for some time now. A 2018 study by the National Institute for Transportation and Communities that surveyed 1,800 e-bike riders found that they bike more often, take longer trips, and make different types of trips than they do on pedal bikes. Plus, not only did more respondents feel safer riding an e-bike than they did riding a pedal bike, the percentage of people who felt safer on an e-bike was even greater when the respondents were women, over 55, or had physical limitations. There are a number of bicyclists, especially roadies, who think ebikes are cheating. I know, I used to be one of them. And there many people who think older people and people with handicaps can’t ride bikes. Because unless you’re racing, bicycling is not a competition. Whether you’re riding for pleasure or transportation, anything that makes it easier to get on a bike is a good thing. For the person doing the riding, for their community, and for the environment. And ebikes make it possible for people who otherwise couldn’t ride a bike — because of age, physical condition, the length of their commutes, or any number of other problems — to get out and ride like anyone else. Going further and more confidently than they otherwise could. There’s another quote from the story that sums it up. E-bikes are not a substitute for safer infrastructure, but they could help move more riders from “Interested but Concerned” to “Enthused and Confident. And that’s a good thing. For all of us. Meanwhile, a Boulder CO newspaper talks with a bike shop owner who says he used to be dismissive of ebikes, until he realized their benefits for people with physical limitations. A British survey shows 72 percent of disabled bicyclists use their bikes as mobility aids, but half of respondents are afraid of being seen riding them for fear of losing their benefits. And more than a quarter of the disabled commutes in Cambridge, England are made by bike. Speaking of electric mobility devices, apparently they’re a wise choice. And not just limited to humans anymore. Sad news, as longtime Tour de France commentator Paul Sherwen died unexpectedly at his home in Uganda; no cause of death was announced. It’s Day 11 of the 4th Annual BikinginLA Holiday Fund Drive. Thanks to Adrienne G and Alan C for their generous donations to the BikinginLA Holiday Fund Drive! By all accounts, yesterday’s Heart of LA CicLAvia was another successful event. But it comes just days after the organization was sued by a woman who suffered a brain injury when a careless rider clipped her wheel. A sports tech website talks with LA-based former pro Phil Gaimon about the tech he uses and life as a YouTube star. A San Diego bike rider suffered life-threatening injuries when he was struck by a driver, who claimed he never saw the victim until he was in front of him. Unfortunately, that’s not too surprising; let’s hope investigators get a warrant for the driver’s phone. Bicycling offers advice on how to buy a women’s bike, and their recommendations for the best bike in 11 different categories. The Executive Vice President and Chief Technology Officer for Walmart talks about his passion for mountain biking, saying he’s learned some of his best business lessons from the saddle. Something I can relate to; I often did my best work while riding my bike. It may be a few years since their last basketball title, but the University of Kentucky can celebrate a national championship as the nation’s most Bicycle Friendly University. A pair of New York bike advocates and engineers say they’ve figured out the exact optimal traffic signal timing to improve safety for everyone and ensure the highest number of green lights for both drivers and people on bikes. A Virginia landscaper had the truck towed to be repaired and ordered employees to say a worker had hit a deer, instead of the bike rider he’d hit in a work truck and left to die on the side of the road. An Op-Ed on Calgary website says traffic laws must reflect the new transport options, including dockless e-bikes. Meanwhile, the Calgary bike boom goes on, even in the winter months, after the city built out a network of protected bike lanes. Sidewalk riding is a complicated issue, according to an Ontario, Canada letter writer in part because of poorly designed bike lanes and the people who drive in them. The Guardian looks at who is behind the effort to have one of London’s most popular cycle superhighways ripped out, pointing the finger at a property company, and truck and taxi drivers. A British man rode 3,200 miles from LA to New York in just 34 days — arriving at the airport half an hour before his flight back home. A new paper by an English researcher argues that yes, drivers really do pass bicyclists who wear bike helmets closer than they do bare headed riders. Brit mountain biking legend Hans Rey was the victim of bike thieves, who took eight bicycles, including custom bikes and bikes that aren’t currently available in the country. Thanks to a new Dutch bike rack design, your bike could power the city. Madrid bans cars built before 2000, and diesel vehicles built before 2006, from driving in the city center to battle air pollution. Los Angeles will need to do the same for the entire county if we’re going to meet pollution, let alone climate change, goals. Malta’s prime minister suggests widening the roads to make more room for all road users, while creating preference lanes for bikes, buses and electronic cars. Tel Aviv is building a 68-mile network of bike trails in an effort to become the Amsterdam of the Mideast. After the first of the year, you’ll need a special driver’s license to operate an ebike in Israel. More grist for the climate change mill, as a New Zealand study shows that bike lanes and pathways do, in fact, coax people out of their cars, resulting decreased emissions. Australian football legend James Hird suffered a broken leg when his bike was hit by a driver. Anyone can win a bike race; the Eurosport website recounts the cycling world’s most spectacular flops of 2018. Aussie cyclist Mark Renshaw will miss a number of events Down Under after he suffered a fractured pelvis when a driver when through a stop sign. Cycling Tips talks with women’s cycling legend Marianne Vos about getting her grove back this year. A roadie discovers he can do more than he thought, completing a 78-mile gravel race despite fears caused by a recent runaway heart rate. No, seriously. If you’re riding a bike with crack and purple heroin, put a damn light on it, already. Call it Waze for bikes. And yes, Vladimir Putin is one of us. Before we start, be sure to read our rare Saturday post if you missed it over the weekend. Now hold on, because we’ve got a lot of ground to cover. Let’s start with this email I received from danger d.
At this point I saw a fire department crew across the street and asked them to call parking enforcement, it was 2:36pm. I then called parking enforcement myself and talked to someone who identified themselves as operator 501 and told me someone else had called (the firemen) and that it would be taken care of. So here are the photos at 5:30 pm, 3 hours later, not one citation, no towing, NOTHING! Obviously the weak plastic pylons which are mostly already run over are of NO use at all as a deterrent and I believe that it is high time that the city put a red curb, or K walls or at the very least some NO PARKING signs up at this location to stop this once and for all as it happens EVERY WEEKEND and as many times as I have called there has been ABSOLUTELY NO ENFORCEMENT AT ALL. I am not even going to get into the 10 or so cars that I saw WELL into the grassy areas of the park near picnic benches, parked by people who think it’s OK to just drive across the bike path into the grass and park wherever they want! I guess they are correct because our city does NOTHING about this AT ALL. When will something be done? Where is Vision Zero? City councilmember? Mayor? Dangerous, too, since it forces riders out into the street where drivers aren’t expecting them. The law is pretty clear on the subject. CVC 21211 explicitly states that no one is allowed to block a bike path, except under very limited circumstances. And parking the family car isn’t one of them. On the other hand, they get it. Ireland’s County Mayo celebrates Bike Week by telling people not to park or drive in bike lanes. Illinois introduces a new public safety announcement, saying we all have to pay attention, especially at intersections, because traffic safety is literally a matter of life and death. But fails to consider that only it’s only the people in the big, dangerous machines pose a significant risk to others. Great video from New Orleans advocacy group Bike Easy, in so many ways. In just over two minutes, they manage to personalize bicyclists, while showing them as part of the fabric of city. And making it clear you don’t have own spandex or a fancy new bike — and can carry a trombone while you ride. Anthony Bourdain was one of us, riding a tandem in France just the day before taking his own life. A popular Instagram account draws over half a million likes for comparing bicyclists to annoying creatures. Never mind that like ’em or not, all of the above are vital to the environment. Thanks to BerKelly for the heads-up. Thanks to Censorthis for the link. Then there’s the New York garbage truck driver who refused a breathalyzer test after plowing into nine — count ’em, nine — parked cars. Not surprisingly, he was booked for DUI. And a Boston hit-and-run driver makes it clear that killing an 80-year old man and driving away afterwards is just no big thing. And it’s not his fault he was speeding, or chose to hit the horn instead of the brakes — let alone aimed at a human being instead of a pole. Nothing like a little role reversal, with the one on the bike giving the tickets for a change. Thanks to J. Patrick Lynch for the tip. Let’s spend a few moments on the Lime beat. The company has established a beachhead in Santa Monica, going head-to-head with locally owned Bird. The new Lime-S e-scooters, developed in conjunction with Segway, will cost $1 to unlock and 15 cents per minute of riding time; you can get a $3 credit towards your first ride with the code LIMEWITHLA1. Meanwhile, a writer for the Guardian questions what the owners of LimeBike were thinking when they programed their scooters to threaten to call the police if they’re not unlocked. Especially in neighborhoods with people of color, who may be just a tad sensitive to that. Santa Barbara wasted no time running Lime out of town, after the company placed 100 scooters on the sidewalks in the morning, and the city impounded them in the afternoon. And nice move from Lime, who have partnered with PayNearMe to make their bikeshare bikes available to people without bank accounts or smartphones, providing 100 pedal bike rides for just $5. No word on whether it will work with their scooters, as well. A new UCLA video explains why transit use is declining, and what to do about it. Besides putting bigger bike racks on buses. CiclaValley re-escapes to the Old Ridge Route. Curbed asks if preparations for the 2028 Los Angeles Olympics could permanently solve LA’s traffic problems, like the ’84 Olympics did for two brief, shining weeks. Speaking of Curbed LA, they’re looking for a freelance transportation writer. A half-mile extension of a Napa bike path could lead riders past a winery to the Napa River, near a historic ferry landing. Strong Towns addresses the perennial debate over parking spaces versus bike lanes, showing proof bike lanes benefit businesses, even if that means the loss of parking. Consumer Reports considers what they’ve learned from crashes involving self-driving cars, concluding that drivers can’t rely on their cars to do all the driving, and they still have trouble recognizing humans. A few more rides to add to your bike bucket list, as Geotab maps out America’s quietest bike routes for when you need a little sanity break from city life. Who says bike riders aren’t tough? A Denver women is going forward with plans for a 400-mile charity ride from Mount Kilimanjaro across Tanzania to the ocean — despite being the victim of a hit-and-run on Thursday. A Michigan town fell about 350 bikes short in their attempt to set a new world record for the longest line of moving bicycles. Columbus OH may have slipped past Indianapolis in size, but still lags behind in bike infrastructure. Then again, so does Los Angeles. As we’ve noted before, NBC weatherman Al Roker is one of us. Or at least he used to be, since someone stole his bike outside a New York radio station. New York’s Daily News gets it, saying the state must renew the law allowing speed cameras, double their number and increase the penalties for repeat violators. Meanwhile, speed cameras are illegal in California, and no one is doing anything about it. A Canadian man is riding across the country to raise funds for mental health after being diagnosed with depression, anxiety and bipolar disorder last year. Yet another dockless bikeshare company has invaded North America, as China’s U-bicycle has come to Western Canada and the University of Victoria. Great idea. A Winnipeg festival brings together bike riders and wheelchair users for a tour of the city. A 17-year old Toronto man faces first degree murder charges, and two others are being sought by police, for intentionally running down a bike rider, then getting out to punch and kick him before stabbing him to death. Nice piece from the Guardian, as a bike rider says the kindness he was shown after a fall on a bike path restored his faith in ordinary people. The war on cars may be a myth, but the war on bikes goes on. Someone has been leaving tacks on a UK bike path, flattening the tires of several riders, including children. They get it, too. The Zambia Road Safety Trust says the country needs to put people first, not cars, in the country’s transport systems. A New Zealand cyclist says there’s no need to improve streets for bike riders, because the city has lots of parks, and he doesn’t see many bike riders on the roads now. Which may be because there aren’t any bikeways yet. Malaysian bicyclists appeal to the country’s transport minister to provide bike lanes, signage and bike traffic signals to improve safety. Getty Images offers pretty bikescapes created by the massive oversupply of dockless bikeshare bikes in China. 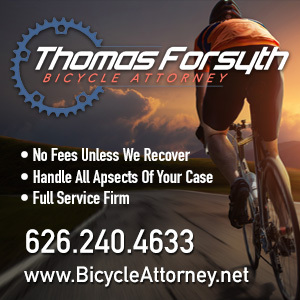 Our old friend CLR Effect recaps the recent Wolfpack Hustle Forsyth Cup at the Encino Velodrome, sponsored by BikinginLA sponsor Thomas Forsyth. The BBC talks with pro cyclist Molly Weaver about the crash that led to her depression and a quest for perfection, before her recent decision to withdraw from the sport. And weird and wonderful derailleurs through history.